Asparagus is a spring vegetable that was once classified belonging to the lily family (related to onions and garlic). It is native in most of the European, northern African and western Asian nations. It is cultivates as a vegetable crop. The appearance of asparagus, for most farmers, is the first sign that spring is starting. For gardeners, asparagus and tomatoes are bestie vegetables. Tomato plant repels the asparagus beetle as the asparagus repel some harmful root nematodes that affect tomato plants. 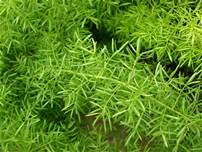 In ancient times, asparagus is known also used for medicing for its delicate flavor and diuretic properties. The finest texture and the strongest and yet most delicate taste is in the tips. 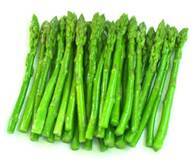 Water makes up 93% of asparagus’s composition that is why it is low in calories and is very low in sodium. Chromium can also be found in asparagus that enhances the ability of insulin to transport glucose from the bloodstream into cells. A rich source of glutathione, a detoxifying compound that helps break down carcinogens and other harmful compounds like free radicals. Aparagus may help protect against and fight certain forms of cancer cells that may lead to bone, breast, colon, larynx and lung cancers. Asparagus is an antioxidants, that neutralizes the cell-damaging free radicals that may help in slow aging. It helps our brains fight cognitive decline with its folate properties, it works perfectly with vitamin B12 that is most commonly found in fish, meat, poulty and dairy products that can prevent congnitive impairment. B12 helps our brains to perform well in speed response and mental flexibility. 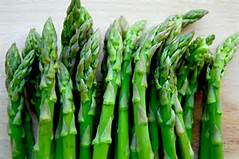 Asparagus contains high levels of the amino acid asparagine that serves as a natural diuretic and increases urination by not only releasing enough fluid but get rid of the excess salts. This helps people with kidney problems and edema. Also benefial to people with high blood pressure and heart related diseases.